President Trump plans to nominate Stephen Dickson to lead the Federal Aviation Administration. 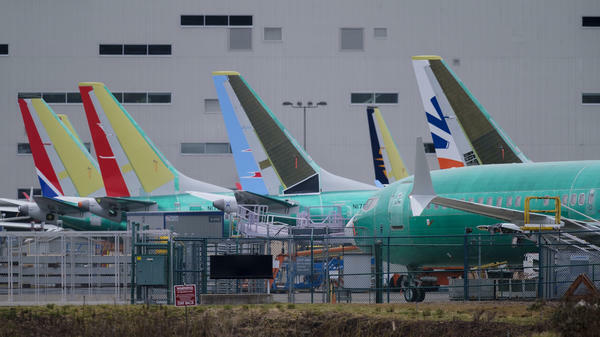 The agency is under scrutiny for its response to two crashes of Boeing 737 airplanes, which are pictured here outside Boeing's factory in Renton, Wash., on March 14. The White House says President Trump will nominate Stephen Dickson, a former executive and pilot at Delta Air Lines, to lead the Federal Aviation Administration. The FAA has come under criticism for failing to quickly ground the Boeing 737 Max after the crash of an Ethiopian Airlines jet this month, the second fatal crash of the Boeing plane in recent months. The FAA grounded the planes only after other nations did so. Acting Administrator Daniel Elwell told NPR's Morning Edition that the agency had been waiting for data to establish a "common thread" between the two crashes before grounding the planes. The FAA has not had a permanent administrator since Michael Huerta, an Obama administration holdover, resigned in early 2018. Elwell has been serving as acting administrator in the interim. According to a White House statement, Dickson recently retired as the senior vice president for flight operations at Delta, where he was "responsible for the safety and operational performance of Delta's global flight operations, as well as pilot training." There have been reports that pilots were upset at the lack of training provided by Boeing for the new plane, as well as criticism that the agency has grown too chummy with the company. In choosing Dickson to lead the agency, the White House has nominated a former pilot who has flown Boeing jets, including the 737, during his career at Delta and whom it calls "a strong advocate for commercial aviation safety and improvements to our National Airspace System, having served as chairman of several industry stakeholder groups and Federal advisory committees." The nomination was announced after the FAA's inspector general launched a probe of the agency's decision to certify the 737 Max, first reported by the Wall Street Journal on Sunday. Transportation Secretary Elaine Chao confirmed the audit on Tuesday, asserting in a statement that "safety is the top priority of the Department, and all of us are saddened by the fatalities resulting from the recent accidents involving two Boeing 737-MAX 8 aircraft in Indonesia and Ethiopia."